Barry and Sheryl Schwartz’s Voodoo Song (English Channel) has turned over a new leaf as a turf router since transferring to the Linda Rice barn after the retirement of veteran trainer Mike Hushion at the end of the Belmont meet last month. 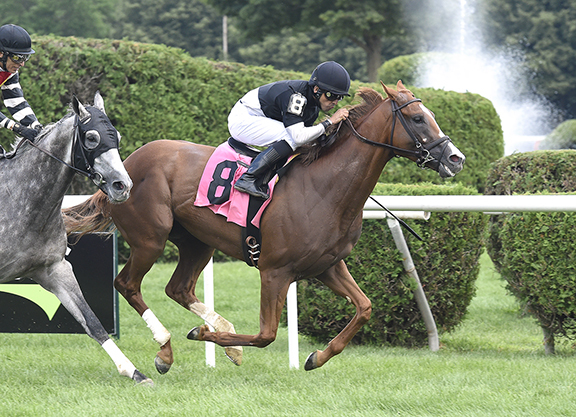 The homebred took his record for Rice to three-for-three over the Saratoga lawn Wednesday afternoon with a front-running score in a New York-bred optional claimer. Runner-up in an off-the-turfer on debut at Belmont in October, Voodoo Song broke his maiden when switched to the turf next out at Aqueduct in November. Off the board in his next three starts on dirt, the last two of which were sprinting, he was then sent to Rice, who removed the blinkers and stretched him out on the turf in a $40,000 claimer at the Spa July 22, which he won by 5 1/4 lengths. Rice did something rarely seen in horse racing these days, running Voodoo Song back on just four days rest in a 1 3/8-mile state-bred allowance at Saratoga July 26. In this case, it worked out great as Voodoo Song took the field from gate-to-wire for a 3/4-length success. The race was not without its tense moments though, as the chestnut bolted out to a 16-length lead early, clocking an opening half-mile in :46.14. Voodoo Song has been quite good at Saratoga, but with just 11 race days left in the meet, it is doubtful he will make another start at the Spa before the meet ends. Schwartz bought Voodoo Song’s dam for $200,000 as a yearling at the 2003 Keeneland September sale and she won two of eight starts for him, including the Open Mind S. going six furlongs on the main track at Aqueduct. Schwartz’s longtime trainer Hushion conditioned Mystic Chant during her New York campaign, which included her lone stakes win. The pair have had several stakes winners over the years, including GISW The Lumber Guy and MGSW Great Intentions, and Hushion continued to train the bulk of Schwartz’s stable until his recent retirement. The conditioner spent the past several years battling cancer and closed his stable doors last month to spend more time with his family. As a result, Schwartz had to distribute his horses among other trainers, including Rice and Todd Pletcher, who both already had horses for the Calvin Klein co-founder. ← How many female trainers are there in the world rankings – and who are they?